By Daniel Horowitz--With the recent dedication of The Leo Baeck Day School’s new and highly anticipated South Campus, a new chapter in the life of Jewish Toronto’s remarkable Jewish educational system has begun. The new campus of Leo Baeck, the only Jewish I.B. (International Baccalaureate) World School in Canada, which transformed the former Arlington Middle School into a state-of-the-art educational and cultural facility thanks to a $5 million renovation, is almost four times the size of its home for the last 21 years, a leased space inside Holy Blossom Temple, less than one kilometre from its new digs. “The school has grown so dramatically in this part of the city that we outgrew our Holy Blossom facility, and have found that this new facility sits in the heart of a vibrant and underserved young Jewish community seeking to reconnect with its Jewish roots,” explained Eric Petersiel, Head of School. 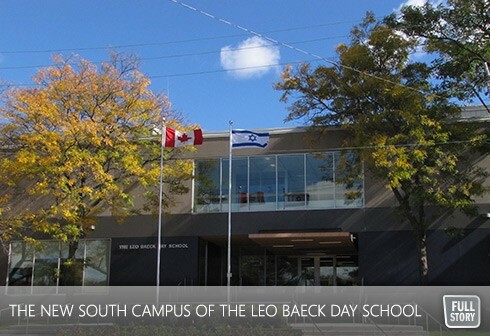 The new and improved campus of Leo Baeck – the Reform movement’s only day school in Canada - includes large classrooms, a dedicated preschool, state-of-the-art science and computer labs, seminar rooms, a double gymnasium, worship space and art, drama and music studios. And, with the new and expanded space, a Junior Kindergarten has been added for the first time on the South Campus, with almost 100 students already registered in the first year. The Arlington campus, which Leo Baeck purchased after the Toronto District School Board declared it surplus, will also open its doors to more than just its students, as the community-at-large will use the premium space for meetings, gym rental, art space and theatrical and musical performances. The new school will also be a beacon for Jewish life in the area, an area which used to be home to a thriving Jewish community prior to many Toronto Jews making the sojourn north along Bathurst Street. “The new Leo Baeck campus offers opportunities for the larger Jewish community, as a community centre providing programming outside school hours,” said Elizabeth Wolfe, Chair, UJA Federation of Greater Toronto, and a Past Leo Baeck President. “At a time when new campuses are being developed in the northern part of the GTA, the new Leo Baeck campus will be readily accessible in midtown, and will serve our community for generations.” And, speaking of the larger community, the first outside user of the new facility will be the Koffler Centre of the Arts, which will use the new venue for its Family Ceramic classes. “It is through similar partnerships with other communal agencies and organizations that the full potential of this new facility will be reached, and its impact on the community realized,” added Wolfe.